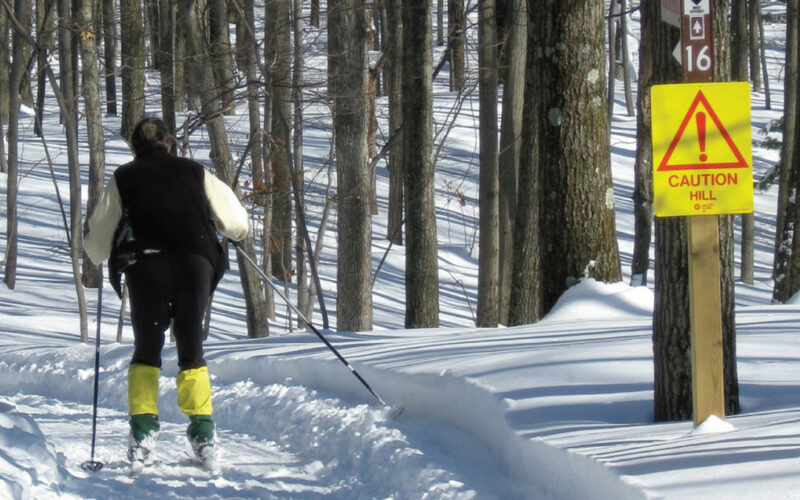 While Caberfae Peaks offers plenty of thrills for alpine skiers, cross-country skiers can delight in a trio of free, groomed, public trail systems in the Cadillac area. Nearest to Caberfae Peaks is the 10 mile-long McKenzie Trail. Local skier Waddy Pothoff has been skiing this trail for thirty years and is the trail’s de-facto good will ambassador. Located in the Manistee National Forest, the Federal Forest Service maintains the trail. There are comprehensive maps at each loop intersection indicating the degree of difficulty and distances for each loop. Pothoff and a group of volunteers chip in with some grooming and track setting on some of the more popular loops. Access to the McKenzie trailhead is via 38 Road off the Caberfae Peaks access road from M-55. The trailhead has a large, plowed parking lot and a pit toilet. For kick-and-gliders looking for a less strenuous workout, the Heritage Nature Trail is a beautiful option. Located just two miles west of downtown Cadillac behind the Carl T. Johnson Hunting and Fishing Center, the groomed two-mile trek winds around a nature study area. “It’s a popular area for wildlife viewing even in the winter months,” notes Josh Pellow, DNR Unit Supervisor for the adjacent Mitchell State Park. The area is home to a wide variety of songbirds, birds of prey such as barred owls, red-tailed hawks, the occasional bald eagle, as well as deer, beavers, and muskrats. A paved parking lot is at the trailhead next to the Johnson Center. Skiing the Heritage Trail combined with a visit to what the locals call the “Carl T.” is a unique way to spend a winter afternoon. The Center features an informative look at the history of hunting and fishing in Michigan, but most enjoy the fish and wildlife displays and interactive kiosks. These always seem to delight children who visit the Center.  While the McKenzie and Heritage are excellent cross-country ski systems, perhaps the most well-known of Cadillac’s trails is the Cadillac Pathway. 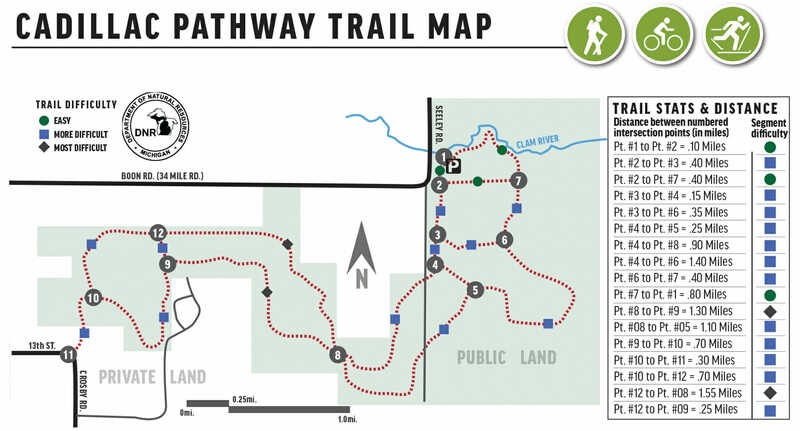 Located just ten minutes from downtown, the Pathway stretches 11 miles through the Pere Marquette State Forest northeast of the city limits. This gem is one of Michigan’s finest XC trails and I ski it every chance I get. Two trail heads with paved parking give the Pathway ultimate accessibility. The north trailhead is off Boon Road east of the U.S. 131 Expressway. The south trailhead is adjacent to the Wexford-Missaukee Career Technical Center where 13th Street turns into Crosby Road. I can park at either end and be immersed in the forest before the echoes of my car door slamming fade away. The Pathway’s layout is superb. The north end, which locals call the Deer Loop because of the likelihood of seeing abundant wildlife, consists of mainly flat routes measuring one, two and four miles. All three loops finish along a scenic section of the Clam River, a free-flowing trout stream. When I’m after a tougher workout and a few more thrills, I ski the south end. This has loops of two and five miles and features several hills that are challenging to climb and heart-thumping to descend. The two ends of the trail are knitted together by a connector section. The total result is that I can ski loops ranging anywhere from 1 mile to five miles, include part of the connector to extend those, or ski the entire 11-mile trail. Adding to all of this is the fact that the Cadillac Pathway’s trail markers, map stations, and grooming are maintained through a cooperative community effort involving students from the Wexford-Missaukee CTC, the Michigan DNR, and volunteers from the Friends of the Cadillac Pathway. When you stand back and consider all of the ski options in the Cadillac area, it’s easy to realize what savvy skiers are finding here. Cadillac is one great ski destination.